In the new podcast episode, a confab with Cathy Trost, the exhibit development director of Newseum, the museum of the news, and which is touted as "Washington DC's most interactive museum." (The above photo of the Newseum exterior is by James P. Blair.) Sure enough, you can't swing a dead cat (or, say, some more journalistic object) in this place without hitting a touch-screen game that allows kids to ask questions and report on a story, or a small TV studio where visitors can play at being a news anchor. I think the real test of a museum is not how many gadgets it has, but how well it fires the imagination of its visitors. If interactive exhibits achieve that, then so be it. Another thing that the aforementioned dead cat will hit is a (usually unobtrusive) sign or plaque naming one or another of the museum's corporate underwriters. 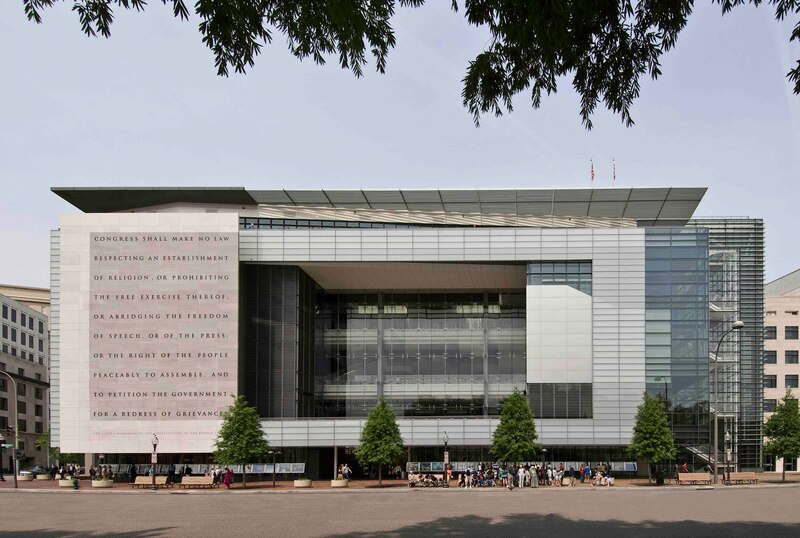 I guess the Newseum has got to survive somehow, but I can't help but wonder how sponsorships affect what the exhibits say, or moreover, what exhibits they can get sponsorships for in the first place. Shows about G-men or the hunt for Lincoln's killer are always popular, and perfectly enjoyable and educational. In places, the main exhibits did address biases in journalists and journalism. But when are we likely to see an exhibit on, say, the mainstream media's unchallenging coverage of the Iraq War? And what corporate giant is going to sponsor that? Those are questions I should have asked Cathy, but didn't. So maybe the experience of talking with her, and then thinking about it later has made me into a bit of a better reporter! And if the Newseum inspires some visitors to go into journalism or ask tougher questions themselves, well, that's an important function. Cathy was a reporter for decades, and brings a genuine spirit of journalistic inquiry to her work with Newseum. Hope you enjoy the episode.